Bottleneck Gallery has announced its third wave of New York Comic Con 2018 exclusive prints, including this killer Superman: The Animated Adventures Screen Print by Tom Whalen that is just jam packed with the Man of Steel’s villains from the popular animated television series. Superman: The Animated Adventures by Tom Whalen is a 12”x36” hand numbered DC Comics screen print. The Regular Edition is limited to 250 pieces and will retail for $45, while the Metallic Variant is limited to 100 pieces and will retail for $55. 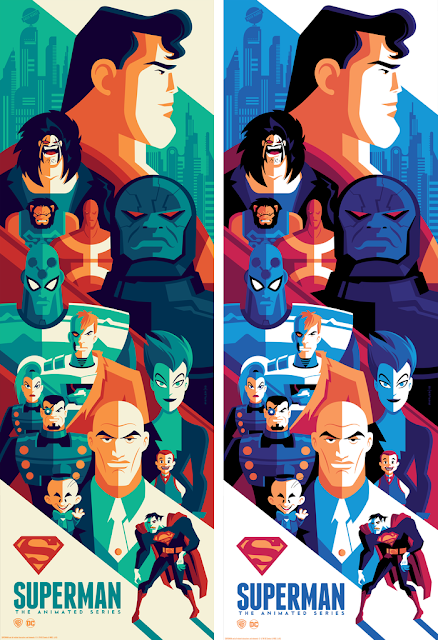 Collectors can purchase these Superman prints at the Bottleneck Gallery NYCC booth #2160.